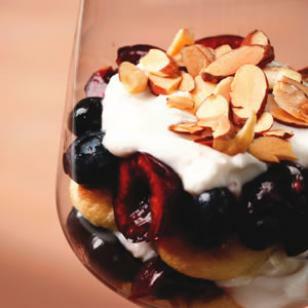 I love dessert and, these layered cherry-blueberry trifles are a great tasting,healthy, and simple make-ahead dessert. We like to use fresh fruit when in season, but frozen (thawed)fruit is delicious and works well too. 1. Toss cherries, blueberries and brown sugar in a medium bowl. 2. Layer 2 ladyfingers, about 1/4 cup fruit mixture and 2 tablespoons yogurt in four 10- to 12-ounce tumblers or similar-size glasses. 3. Repeat with another layer of ladyfingers, fruit and yogurt. 4. Refrigerate for at least 1 hour or up to 1 day. 5. Top each serving with 1 tablespoon almonds just before serving. Notes: For this recipe, we recommend using ladyfingers with a soft, sponge-cake texture found in the instore bakery of most supermarkets. The crunchy Italian ladyfingers (sometimes found near specialty cookies) are too big to fit into individual serving dishes and won’t soften as well. Per serving: 236 calories; 4 g fat (0 g sat, 2 g mono); 14 mg cholesterol; 44 g carbohydrates; 20 gadded sugars; 9 g protein; 3 g fiber; 30 mg sodium; 183 mg potassium.